The Porsche 911 is an iconic marque, and none more so than models with the RS designation. Standing for ‘Rennsport’ (German for racing), the RS variants of the 911 truly are the road-going race cars to be coveted. The latest evolution, the 991 GT3 RS is no exception. Advertised by Porsche as the car to push limits and break boundaries, everything about this car screams performance, power and aggression. 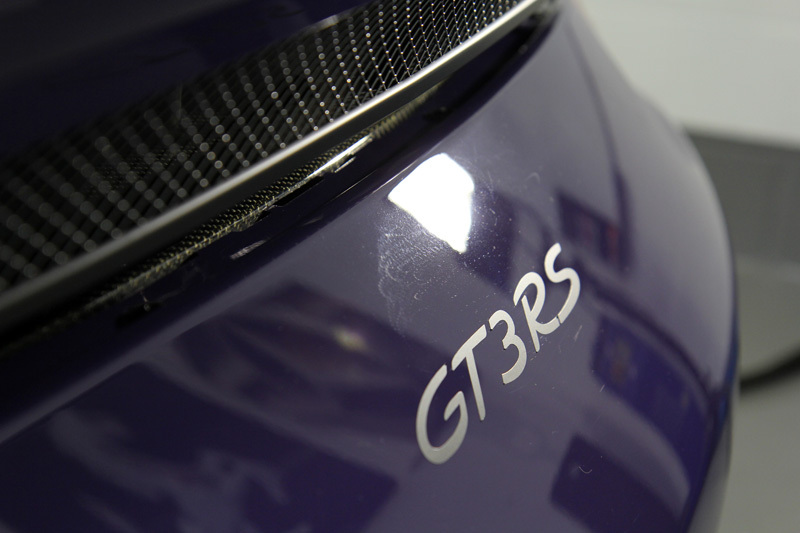 Delivering a heart-stopping 0-62 in 3.3 seconds, the GT3 RS is a true explosion of power. Each part of the car has been designed with performance at the forefront. The six cylinder, four-litre engine, mounted low at the rear, with dry sump lubrication all keep the rear wheel drive monster in control even right on the edge. Clever use of carbon, titanium and magnesium keeps the weight low and the performance thrilling. 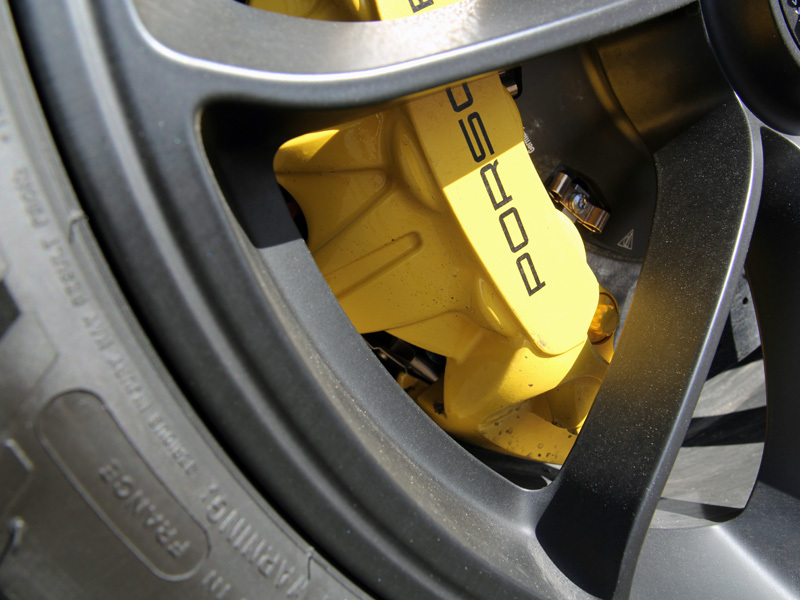 The Porsche Doppelkupplung (PDK) transmission and direct fuel injection send the 991 GT3 RS roaring past anything else on the track, giving others a fleeting view of the beautifully crafted lightweight carbon wings, of front wheel arch air outlets that allow the passage of air drawn in over the tyres, countering lift. They may catch a glimpse of the 21 inch rear wheels, launching it forwards. Whether they see it again before the finish line is up to the driver! Given the astonishing performance guaranteed from the 991 GT3 RS, it’s hardly surprising the owner of this one had to wait eight long months before taking delivery. 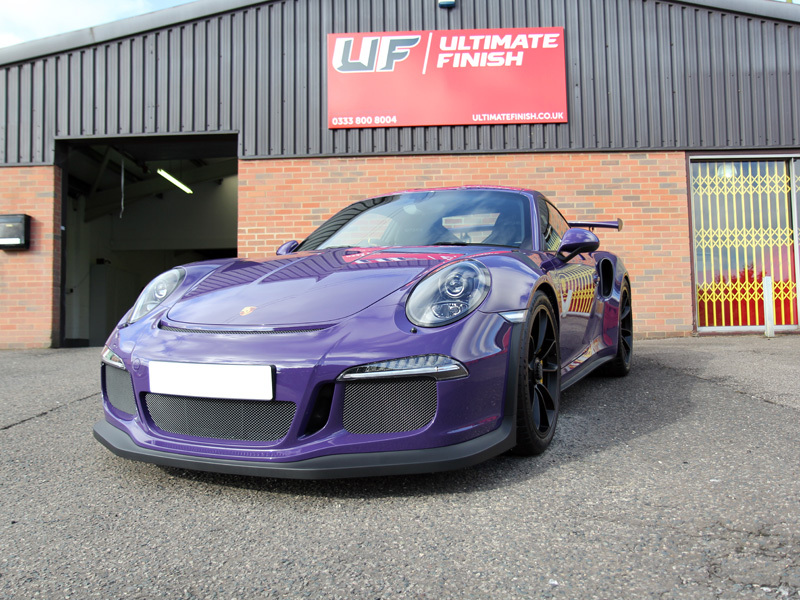 Brought to UF’s Brand Hatch based Detailing Studio directly from the dealership, he was keen to have his new pride and joy protected, right from the outset. 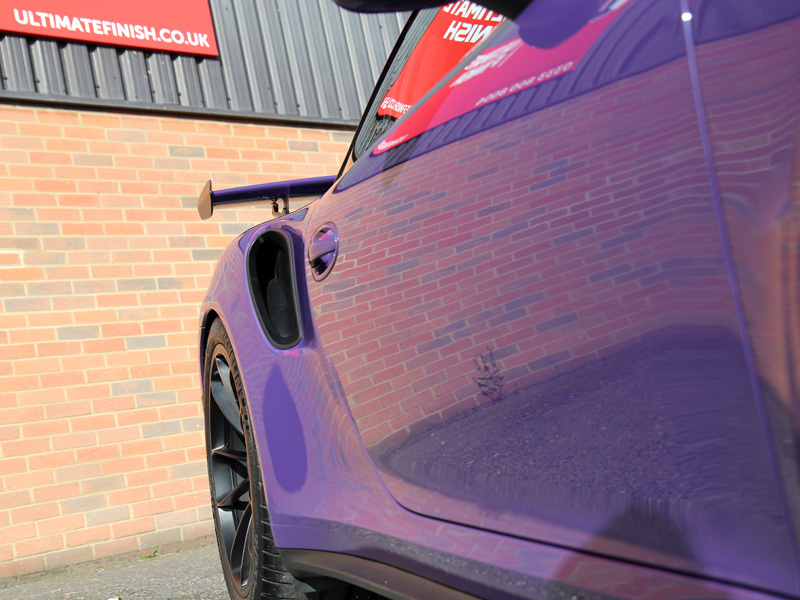 Booked in for a New Car Protection Treatment, the GT3 RS arrived with little more than delivery mileage on the clock. Given the inclement weather, the unprotected wheels had collected a fair amount of road dirt from the journey to the studio, so the cleaning process started by first washing them using a separate UF Wheel Wash Bucket and Grit Guard to avoid any cross contamination with the paintwork. 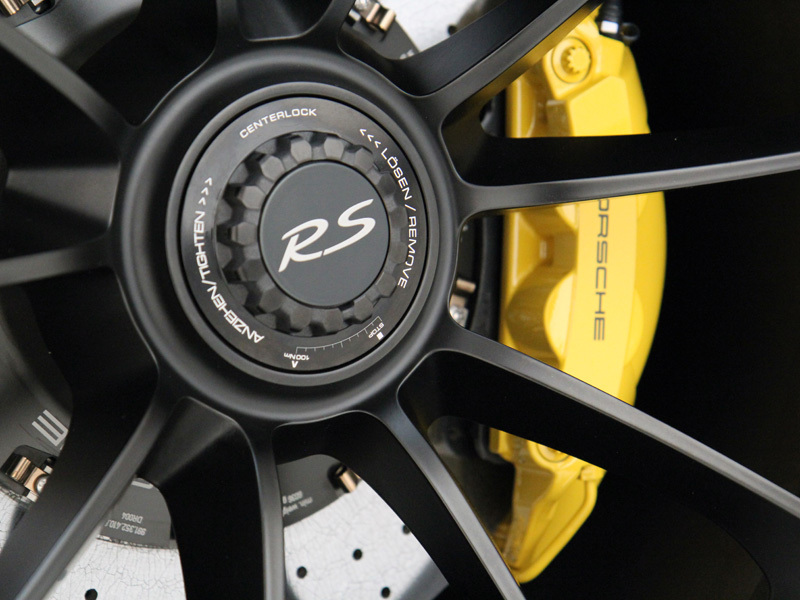 As the RS is equipped with ceramic brakes iron contamination wasn’t an issue so Bilt-Hamber Auto Wheel was used. Auto Wheel is a water based pH-balanced wheel cleaner that effectively removes dirt and grease without relying on harsh chemicals. After allowing to dwell for a short while the wheels were rinsed using a Kranzle HD K7 Pressure Washer. After the wheels had been cleaned, the whole car was treated with Bilt-Hamber Surfex HD to remove any residual transportation wax, grease and oil-based contamination. Next, the larger particles of dirt and grit were removed from the surfaces of the car using Ultimate Snow Foam. 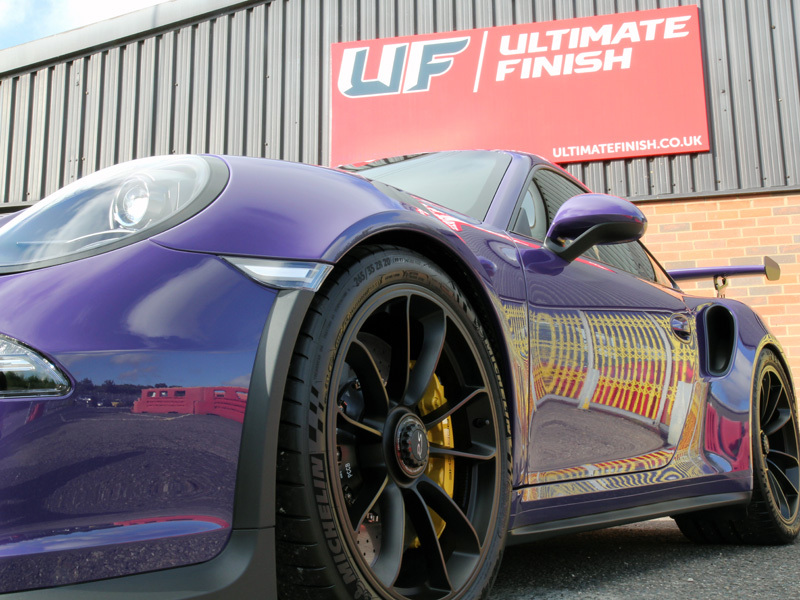 Applied through a Kranzle adapted foam lance attached to a pressure washer, Ultimate Snow Foam creates a thick foam that clings to vertical surfaces, lifting contamination away from the paintwork and allowing it to be easily rinsed away. 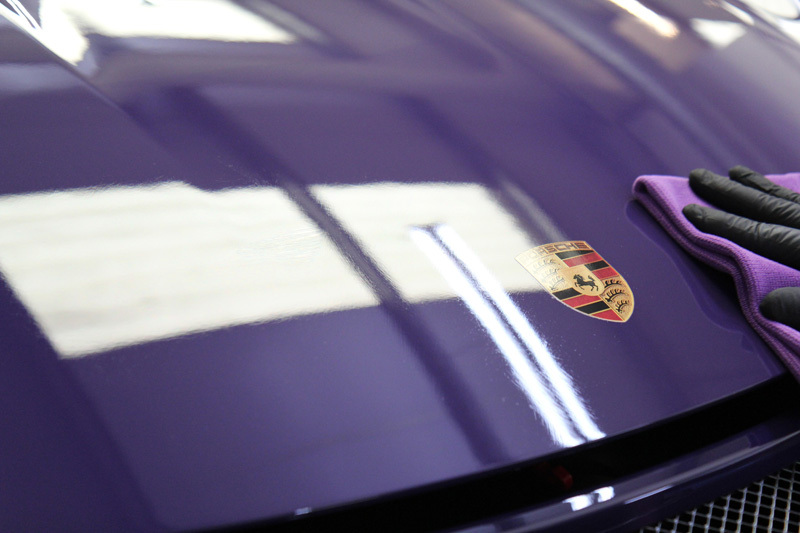 This is a crucial step for protecting paintwork from incurring swirls and scratches during the main wash, as grit is removed without a wash mitt coming into contact with the car. 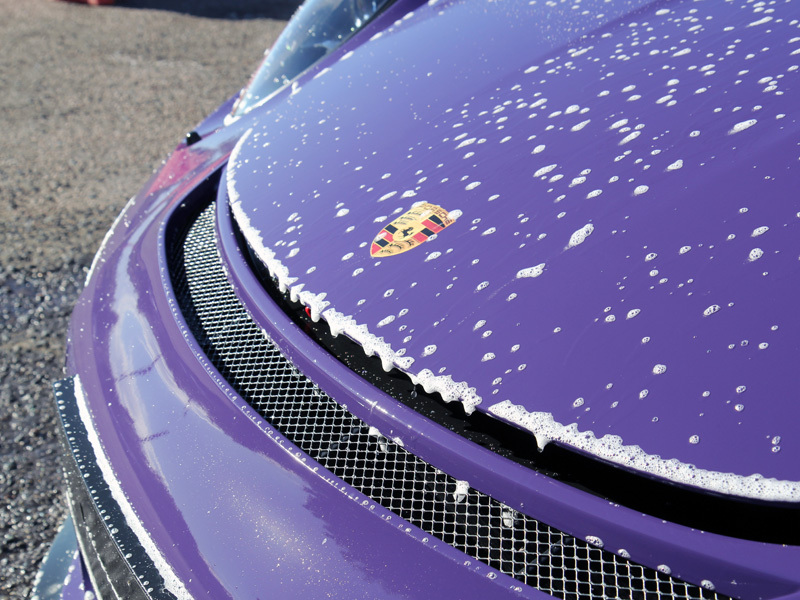 After allowing the foam to dwell for a few minutes it was rinsed away before the car was carefully washed using the Two Bucket Method, an Ulti-Mitt Double Sided Merino Wash Mitt and Gtechniq G-Wash shampoo. This method separates wash water from rinse water and uses Grit Guards placed in the bottom of the buckets to remove contamination washed off the vehicle by the mitt. The mitt brushes over the Grit Guard in the Rinse Bucket, dirt settles to the bottom, the mitt then is wrung out and then reloaded using clean soapy water from the Wash Bucket. 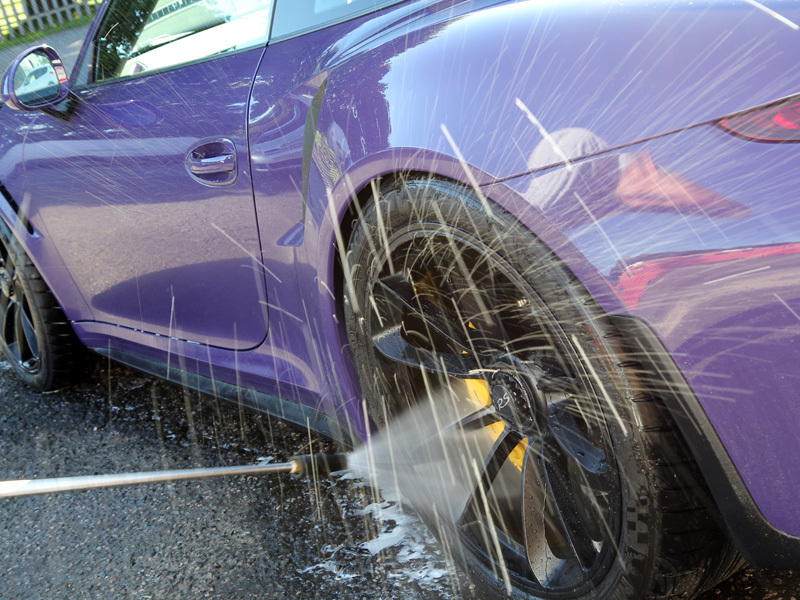 Once completely clean, the car is then rinsed clear of suds before an Aqua Gleam De-ionising Water Filter is attached in-line with the hose to give a final, pure water rinse. 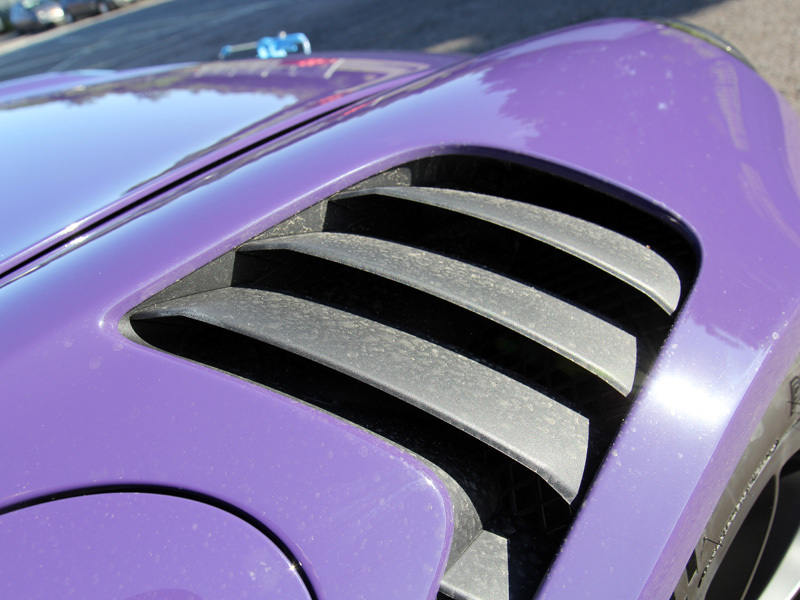 The car is dried using an air blower to ensure moisture is completely removed from all the hard to get to areas, around grilles and air intakes. 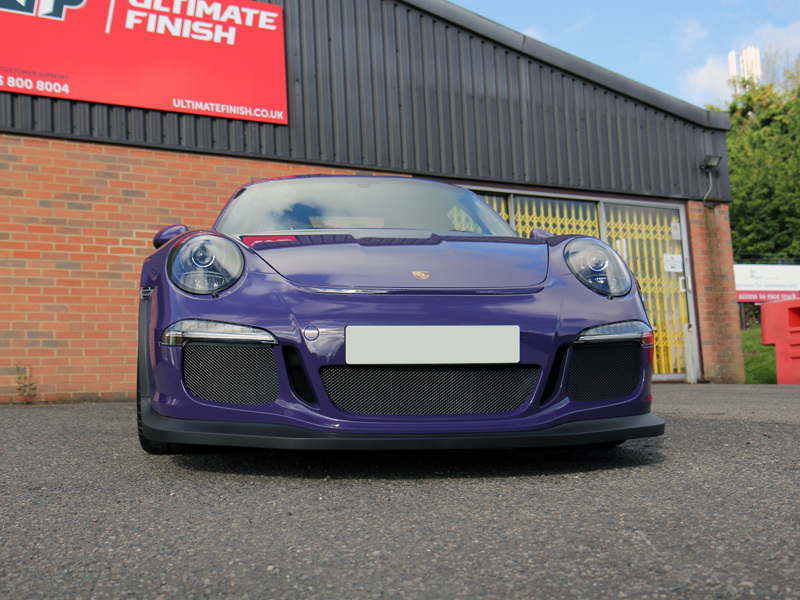 Subsequently, the GT3 RS was inspected under high-intensity lighting to determine the true condition of the paintwork and at this point, an unexpected amount of damage was uncovered. To get a second opinion, an inspection was arranged with a bodywork specialist who works closely with UF Detailing Studio. His assessment of the damage confirmed the original hypothesis that it was likely to have occurred at the factory. He identified the marks as: “likely to have been caused where the factory has flattened out aspects of the paintwork using a 2.5 inch pneumatic DA sander and then finished with a refining polish that contains fillers which would have initially masked the defects”. 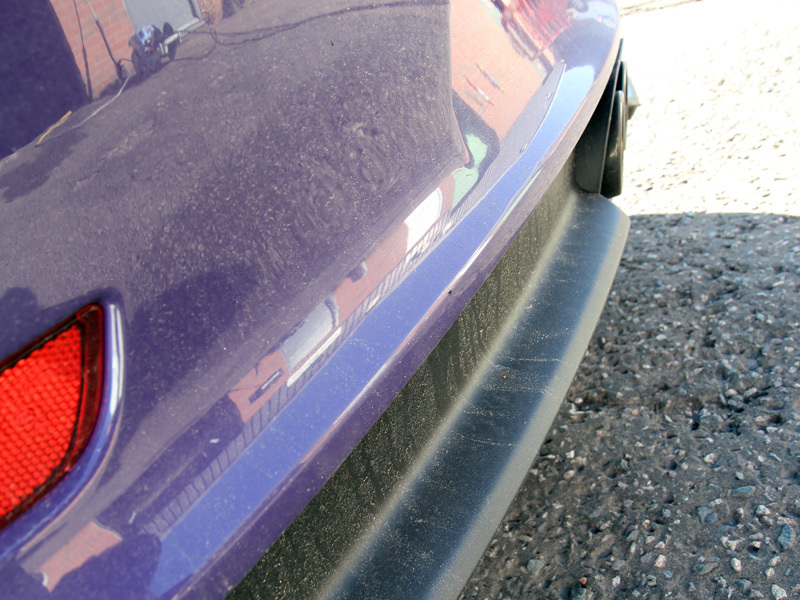 Once the car was washed, the filler agents were removed, revealing the damage beneath. 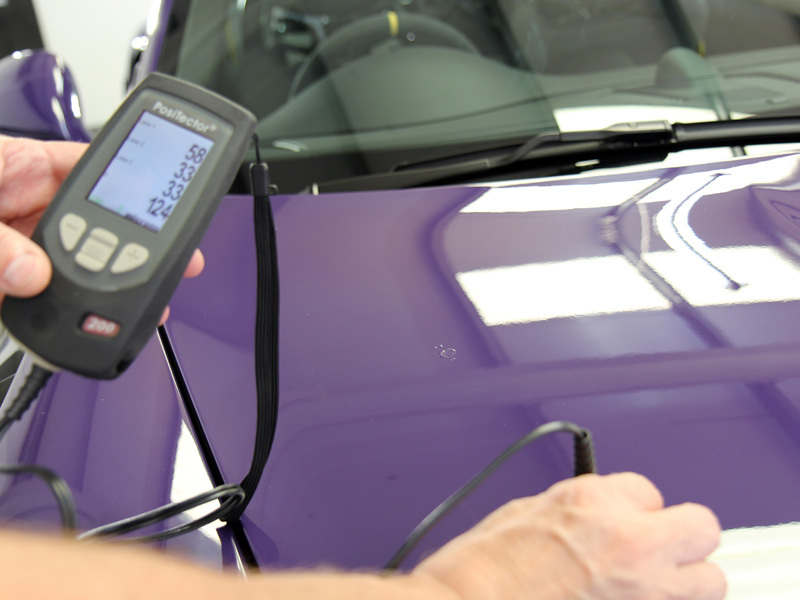 Before starting the two stage machine polishing process, paint depth readings were taken over each panel using a Defelsko PosiTector 200 Paint Depth Gauge, suitable for use on non-ferrous substrates – much of the GT3 RS is made of components which will not return readings on standard, metal-only readers. This gauge uses ultrasound technology to measure three individual layers: primer, paint and lacquer over ferrous substrates as well as carbon fibre, polycarbonates, magnesium and titanium. For the correction process, a FLEX PE14-2 rotary machine polisher was used, with a 3M PERFECT-IT III Yellow Polishing Pad and Menzerna Medium Cut Polish 2500. Using the FLEX M14 Backing Plate Extension and the 3M PERFECT-IT III Yellow Polishing Spot Pad, the smaller areas were corrected. 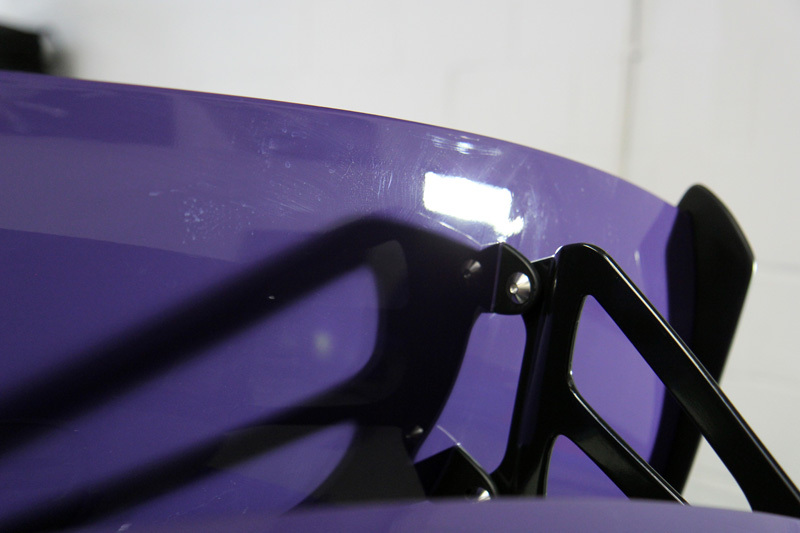 This combination allows for intensive polishing and control in hard to reach places. To refine, a 3M PERFECT-IT III Black Finishing Pad was used with Menzerna Super Finish Plus 3800, a finishing polish with the lightest of polishing abrasives to remove any fine holograms or swirls. 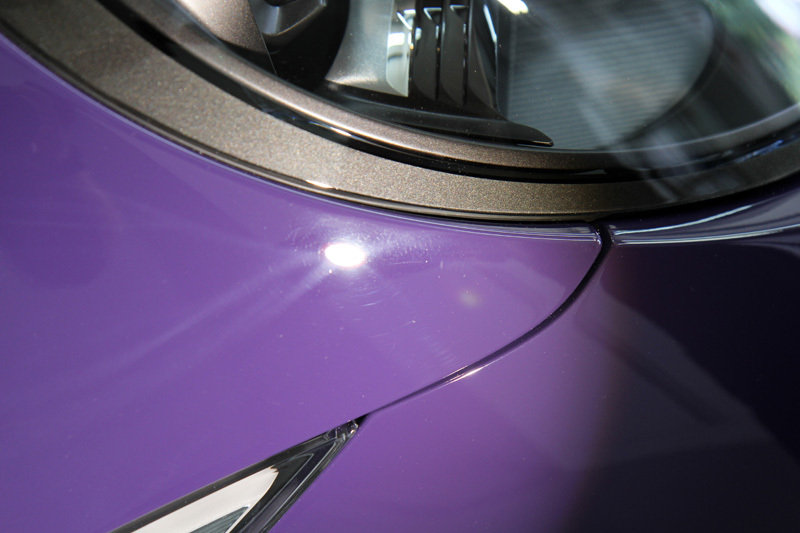 Operating the FLEX PE14 at very low speeds to avoid undue heat build-up, the paintwork was fined out to a high gloss shine. 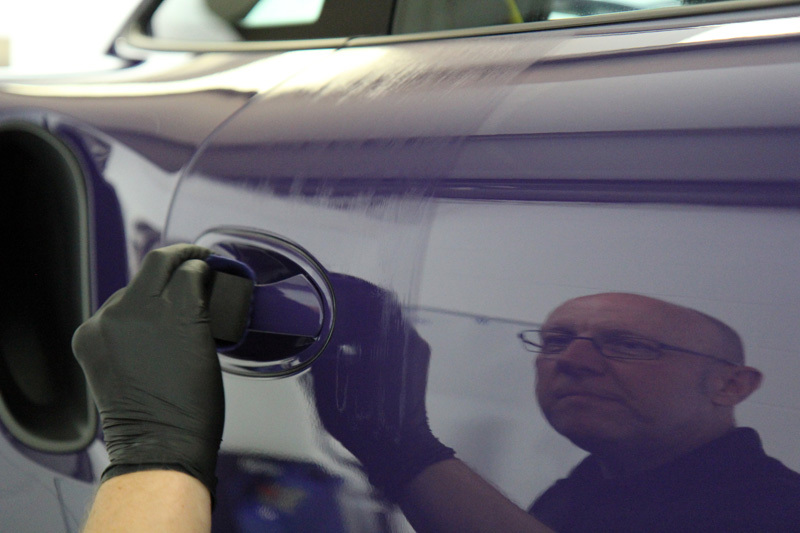 Once happy with the results, the bodywork was cleansed using a residue remover, preparing it for the Gtechniq CS Black dual-layer sealant. 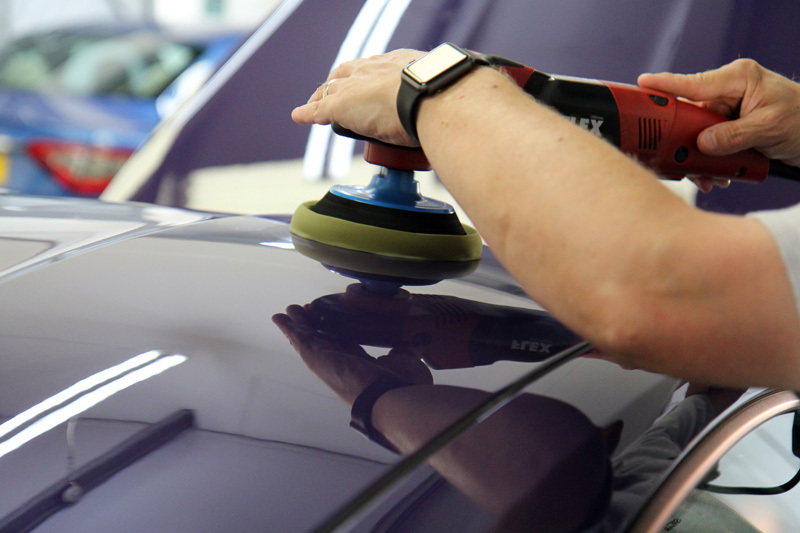 This consists of a layer of Gtechniq Crystal Serum nano-ceramic sealant being applied first, to give the finish an incredibly durable surface resistant to wash-induced swirls, extremes of pH and industrial and environmental fallout. After allowing it to cure for three hours this is then topped with Gtechniq EXO v2 Hybrid Coating for additional slickness and gloss. Crystal Serum is applied as a thin layer which cures as two separate but connected layers: the lower layer is softer to allow flexibility in the event of pressure (that would inflict swirls), the upper layer cures to around 9H on the pencil scale to provide a swirl-resistant surface. Once applied each panel is then buffed off with a soft, clean microfibre towel. 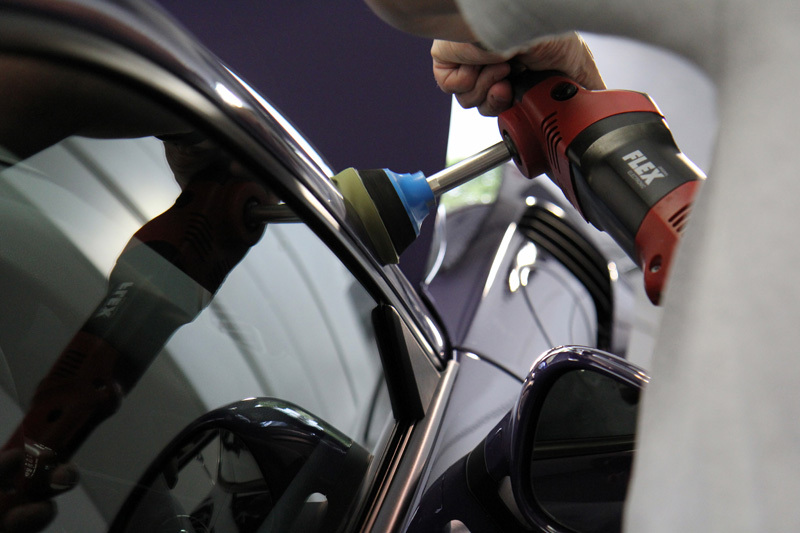 Each area of the vehicle is carefully treated to ensure complete and comprehensive coverage. 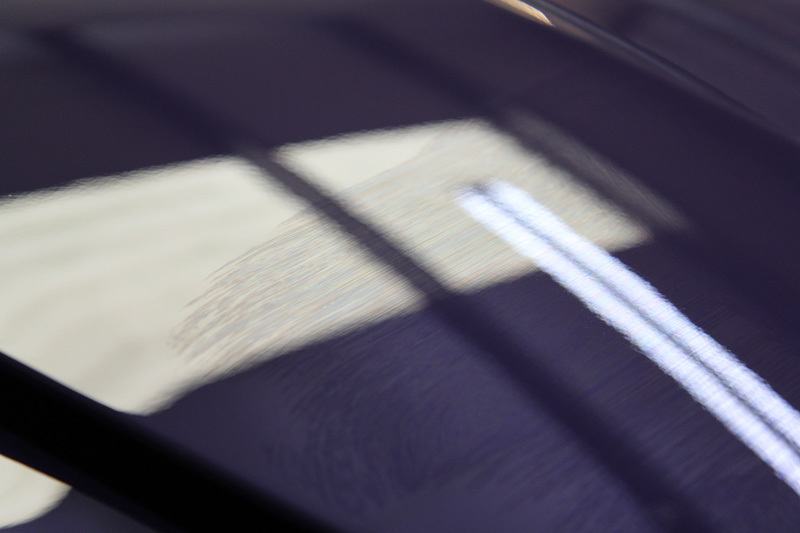 The additional hydrophobic element of EXO v2 Hybrid Coating encourages dirt and rainwater to bead away from the surface of the car, helping to keep it cleaner for longer and discouraging dirt from adhering to it. This makes washing the car much easier and safer for paintwork in the future. The gloss level it leaves behind is seriously impressive. The glass was protected with G1 ClearVision Smart Glass to repel water, making driving easier and less tiring during bad weather. The rear quarter windows and back window, being made from Plexiglas to save weight were treated with Gtechniq G5 ClearVision Glass Coat. 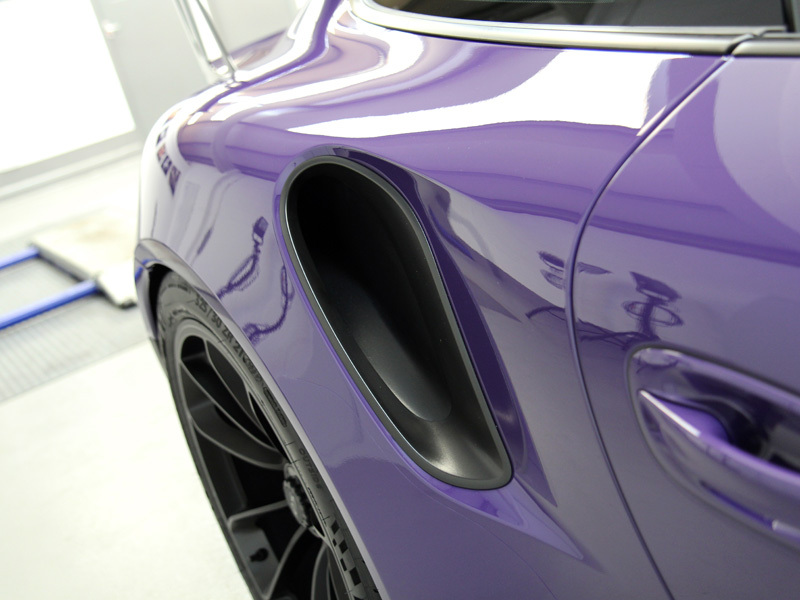 The wheels were protected using Gtechniq C5 Alloy Wheel Armour. This heat resistant nano-ceramic sealant repels dirt, water and road grime, helping to keep hard working wheels looking their best for longer. With the paint now corrected, refined and presented to a level befitting this iconic marque, the owner collected his new acquisition safe in the knowledge that not only does it look stunning but that it is protected for many fun-filled miles to come!